Arena’s default home page consists of several navigation bars allowing users access to specific features. The navigation area may vary by user. Even though Arena’s home page consists of several default navigation bars, your Arena Administrator can add additional elements to easily provide information to you such as staff birthdays and organization statistics. • Click "shelbyarena" to return to the home page at any time. • Click the menu icon to collapse or expand the the Left Navigation Menu. • Enter your Quick Search criteria. • Subscribed Groups - The first number following each Group name represents “In Process” status group registrants. The second number represents “Connected” status group registrants. • Subscribed Tags - The first number following each Group name represents “In Process” status group registrants. The second number represents “Connected” status group registrants. The first number following a Ministry Tag represents “In Process” status tag members. The second number represents “Connected” status tag members. The first number following a Serving Tag represents the serving tag members with specified Tag Status for prospective volunteers. The default is No Contact but can be customized for your organization. The second number represents prospective serving tag members where the tag status has not been changed in the specified number of days. Specified days are Organization Settings set by your Arena Administrator. The third number presents the number of serving tag members that have the “Connected” Tag Status. Connected Tag Status is considered to reflect tag members whom are currently engaged and serving in the respective position. oRefresh Cache - Refresh Cache is a process that updates stored system values within Arena, such as security rights, lookup values, module settings, etc. oMy Details - Opens your Profile Information page. oModule Settings - Quick link to module settings. oEdit Page Details - Quick link to page settings. oPrint Page - Prints the active page. oHelp - Link to online help for the content on this page. This can be installed from the Help Topic URLs found in the Arena Hub under Administration. oAbout - Displays product version information. Breadcrumbs: Provide a trail for you to follow back to the starting or entry point. While reverse navigation using breadcrumbs is recommended, on some pages you can elect to click the browser back button. Left Navigation Menu: Displays primary features of Arena. 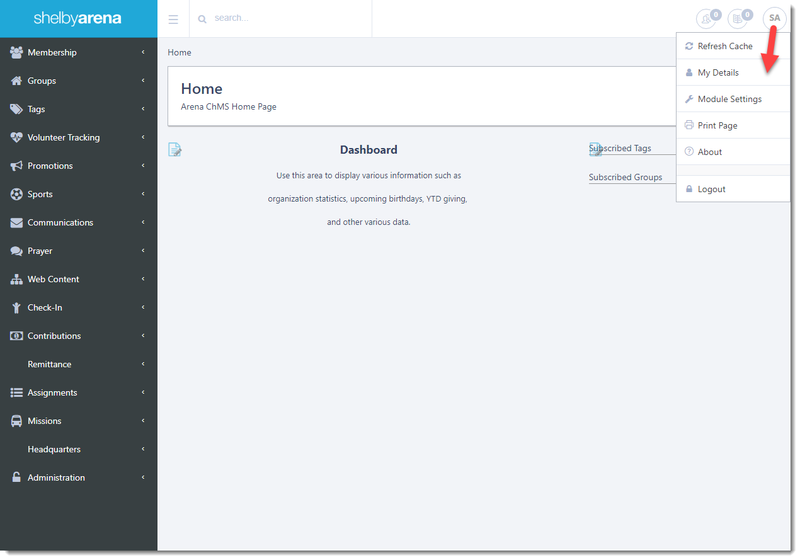 Click any feature button to display child pages for that features. Available pages may vary by user. Right Navigation: Provides user-specific links to Groups, Tags, and Assignments. Click the link of any Group/Tag to display that Group/Tag. Click the Assignment link to display the assignment details. Groups and Tags links include numbers that represent participant status in the respect Group/Tag. Customized the Dashboard to display a variety of information such as staff birthdays and organization statistics. Use the home page of Arena, or any other page to provide organization wide or ministry specific information. While the opportunities are vast, security can be set so that specific staff have access to specific information. The following are some examples, using the available modules. This is an example of using the 2-Dock Container module with two separate Report Grid from Query modules to display specific information and statistics. This example uses the Dock-3 Container module, Pages as Tab module and the Report Viewer module to organize reports by ministry. 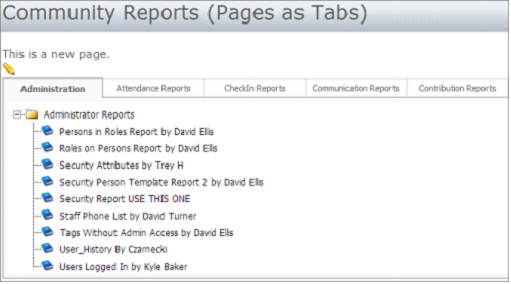 You can apply security to each tab so that staff can access the specific reports based on area of ministry. This example uses the 3-dock container module and several of the Social modules to provide individual information. This example uses the Advanced HTML module and Hyperlink Manager within the module to create links to documents.